The following article by Adam Goodheart was originally online at Discovery.Com, from their feature "Dead Inventors' Corner" (which is now, alas, dead as well). This article is copyright © 1996 by Adam Goodheart, and is reprinted here with the kind permission of the author. Dolores Chumsky's house leaks. There's no way to fix it. "Just try and get someone to come and make repairs," laments the Union, N.J., resident. "They may come in once, but they never come back." That's because Chumsky's innocent-looking suburban residence is a handyman's nightmare. It also stands as a monument to one of the most colossal flops in the history of scientific innovation. 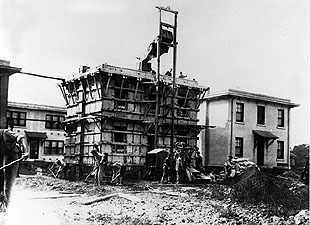 It is one of a dozen surviving examples of Thomas Edison's worst invention ever: the single-piece cast-concrete house. Edison's concrete houses aren't quite as well-known as, say, the incandescent bulb, the phonograph, or the motion picture. Yet the great inventor devoted nearly as much time and effort to them as he did to any of his better-known discoveries. He even dreamt of a future in which millions of Americans would not only live in concrete houses, but also sleep on concrete beds, and play music on concrete pianos. It was a classic case of one failure begetting another. In the late 1880s, Edison had turned to perfecting a new process for refining iron ore using magnets and massive crushing rollers. The enterprise wasted more than a decade of effort and several million dollars. But instead of selling the equipment for scrap and calling it a day, the redoubtable Edison decided to use the huge rollers to manufacture high-grade cement. By 1906, four years after its opening, the cement plant, too, had become a money pit. But if no one wanted his cement, the Wizard of Menlo Park declared, he would create his own demand. That August, in an after-dinner speech in New York City, Edison announced his latest brainchild to the world. Concrete homes, he said, would revolutionize American life. They would be fireproof, insect-proof, easy to clean. The walls could be pre-tinted in attractive colors and would never need to be repainted. Everything from shingles to bathtubs to picture frames would be cast as a single monolith of concrete, in a process that took just a few hours. Extra stories could be added with a simple adjustment of the molding forms. Best of all, the $1,200-dollar houses would be cheap enough for even the poorest slum-dwellers to afford. Scarcely less extravagant were the claims of Edison's admirers. "The time will most certainly come when whole houses will be turned out in one piece," a biographer declared in 1907. When the molds were removed, he wrote, "a solid and almost bomb-proof house will be left behind." Because New Jersey has not yet been subjected to extensive bombardment, the veracity of that statement is hard to test. In nearly every other respect, however, Edison's early prototypes proved disastrous. Instead of simple molds, the houses required nickel-plated iron forms containing more than two thousand parts and weighing nearly half a million pounds. A builder had to buy at least $175,000 in equipment before pouring a single house. Furthermore, nobody wanted to live in a residence that had been dubbed "the salvation of the slum dweller." 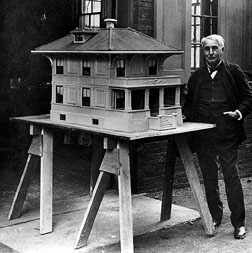 Although Edison optimistically described an early model as "in the style of Francois I," it was more in the style of an oversized outhouse. Undaunted, Edison announced that he was generously turning his invention over, free, to anyone who wanted to help humanity. Building contractors didn't exactly beat a path to his door. So in 1911, the inventor made another go of it. This time, he announced, he had discovered a product line for which concrete was ideally suited: home furnishings. Using special lightweight "foam concrete," Edison proposed the manufacture of concrete phonograph cabinets and concrete pianos. Concrete bedroom sets -- more durable and beautiful than those "in the most palatial residence in Paris or along the Rhine" -- would cost a mere five or six dollars. Edison even planned to market concrete tombstones. "As to concrete dogs to stand warningly in the front yard and concrete cats to purr stonily under a concrete kitchen range, he made no announcement," noted the New York Times. But the bubble burst quickly. Amid a flurry of press releases, Edison shipped a pair of concrete phonograph consoles round trip to New Orleans and Chicago. The crates were marked "Please drop and abuse this package." Yet they never made it to their much-hyped appearance at a trade show back in New York. Edison himself never appeared at the show, and thereafter refused to discuss concrete furniture. Apparently, the cabinets had arrived at their destination in somewhat more than one piece. Incredibly, despite such spectacular failures, the Edison Portland Cement Company remained in business. It lost millions of dollars, went bankrupt twice, and published a book with the unlikely title The Romance of Cement. A few years after its founder's death in 1931, the company closed for good. The ill-starred rolling machinery was shipped off to a nitrate mine in Chile. All that remained of Thomas Edison's malformed brainchild were a few yellowing patent claims -- and Dolores Chumsky's leaky house. Copyright © 1996 by Adam Goodheart. Reprinted with permission of the author. Originally appeared on Discovery.com. Photos courtesy of the Edison National Historic Site/National Park Service. But did Edison invent cement overshoes?